Synopsis: Two salesmen whose careers have been torpedoed by the digital age find their way into a coveted internship at Google, where they must compete with a group of young, tech-savvy geniuses for a shot at employment. Review: Though summer is traditionally the time of big budget franchise pictures that boast state of the art special effects and gigantic action sequences, it’s nice to remember that there are also high profile studio pictures that provide nice counter programming to more bombastic films. 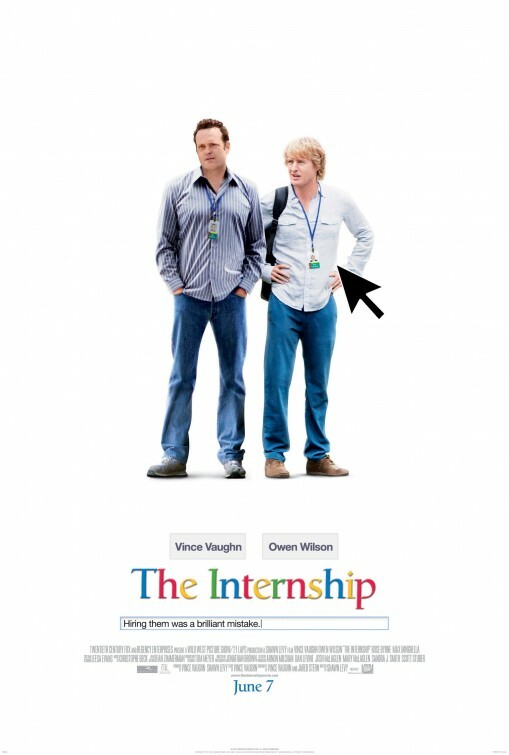 Now along comes The Internship, a comedy that takes a big gamble that pays off for the most part and proves that you don’t need superheroes and alien effects to entertain. It’s hard to imagine everything that was on the line with the pitch that screenwriter Vince Vaughn and Jared Stern made to the studio in hopes of getting this movie made. A comedy about two washed up salesmen that worm their way into a summer internship at Google, the entire film really depended on the participation of the massive internet company. Without them, the movie simply couldn’t have been made. Thankfully, after reading the script the company agreed to lend their name and blessing to the genial comedy and even if it could be argued that the movie is just one big ad for Google there’ s no denying that there’s a fun movie at the center of all the product placement. Giving viewers an inside look at the Google campus (though little to none of it was actually filmed there), we see the atmosphere that the company has created with free food, nap pods (I’d like to order one of those, please), slides that take you from one floor to another, and a collegiate atmosphere that stimulates creativity while pushing the boundaries of imagination. I get the impression that this was originally targeted as an R-Rated feature but it’s relatively tame considering that the film stars the men from 2005’s raunchy Wedding Crashers. More than a few times I could tell some more explicit words and images were removed to get the film to more audience friendly PG-13 but it really doesn’t matter because the comedy comes from a more genuine place and its largely thanks to its stars. While Vaughn struck gold early with Swingers he only manages a good film every fourth movie released. He’s in his comfort zone here as a fast-talking dyed in the wool salesman that suddenly is up against people half his age that have double the tech knowledge he so sorely lacks. Wilson (who seems to look more like a young old man with each film) is a nicely centered counter to Vaughn’s more hyperactive character. The two work well together and even if a few of their likely ad-libbed scenes go on a little too long you can tell that there’s a real respect there. As part of their internship, Vaughn and Wilson must team up with a group of misfits to complete challenges that will get them one step closer to a full time job at the end of the summer. The plot actually reminded me of the recent Monsters University where two goofballs are forced to work with a team of outcasts to gain admission to a highly competitive college program. Instead of monster related shenanigans, The Internship puts Vaughn, Wilson, and their outliers up against a set of Google related challenges and asks them to square off opposite a perfectly smarmy Max Minghella. Normally I bristle at a romance that feels shoe-horned in but the playful banter exchanged between Wilson and Rose Byrne (The Place Beyond the Pines) is genuinely surprising and makes good use of the refreshing appeal of both actors. Byrne’s role could easily have been a one-note ice queen that gets melted by Wilson’s aw-shucks charm but she gives some extra gravitas to her take on her character that somehow makes a familiar romantic sparring situation feel new. Director Shawn Levy (Night at the Museum) keeps things moving at a nice pace and for a comedy that almost tips the scales at two hours the result is a breezy laugher that’s as harmless as a low-level virus that has infected your G-Mail account. Even a cameo by the sometimes unrestrained Will Ferrell lands squarely on the funny bone and doesn’t overstay its welcome. While The Internship is most likely a film with little re-watch value, there’s a lot of fun to be had if you’re up for something that doesn’t involve star treks with iron men of steel on the pacific rim. I had a real good time checking this one out at an advanced screening last weekend. I was a bit surprised that I enjoyed it as much as I did considering the PG-13 rating. This film seems to be getting a lot of hate do to it’s affiliation with Google.